All photos courtesy of Shred. People know I love the Chicago Bulls, I have this website dedicated to the team for crying out loud. So people will often approach me with something they’ve found online they think may be of interest. Sometimes I may have already have seen what they offer up, occasionally something may pique my interest, rarely am I blown away. That is life-sized Michael Jordan piece of wall art you see before you. Created by Sydney based artist (and dog lover) Mr. G Dogathon 100, the interior piece took approximately eight hours to complete and is a combination of both spray paint and airbrush art. The attention to detail is on point and perfectly captures MJ’s likeness, the color of the Bulls uniform and his Jordan V’s. I think you’ll agree, it is beyond impressive. It was commissioned by Michael Jordan fan @sneakerheadaus, he definitely got his money’s worth. If you didn’t get the chance to visit the store today, it is open again tomorrow from 9 AM until 7 PM and again Thursday for a limited time only before the tour makes it’s a way to Sydney. Joakim Noah Plays Defense on Kevin Durant. Australian illustrator Chris Edser is back at it again. In the latest installment in his Joakim Noah series, Chris has the Bulls big man facing off against Thunder Superstar, Kevin Durant. Like LeBron before him, KD comes off second best. If you haven’t checked out the Screamdance team’s other works yet, be sure to visit their tumbler Ron Artist (or MettART World Peace). Joakim Noah Plays Defense on Lebron James. Earlier today the Chicago Tribune profiled the animated works of Australian illustrator Chris Edser, who in conjunction with his business partner Sam Barrett runs the Ron Artist site (Well worth checking out if you’re into drawing and basketball). In a series of Gif images, Chris highlighted the many nuances and aspects of Joakim Noah’s game. After I reached out to Chris via twitter, he was kind enough to offer me exclusivity on his latest animated installment in his Joakim series which I’m sure you’ll agree is all kinds of cool. As you’ll see below, it’s perfectly timed with the Playoffs set to commence this weekend. In case you missed his work in the Tribune earlier today, I’ve posted some more of his Joakim animations below. If you would like to check out more of the team’s work, head on over to their website Screamdance.com where they also sell some very cool t-shirts. So apart from the Chicago Bulls, Chicago itself and basketball, I have a few other passions and hobbies. One such passion is art, from Caravaggio to Basquiat I can appreciate art in all its forms and the people who create it. In a new feature beginning today on this site (and one that I hope will become a permanent fixture), I will be profiling artists that I’ve come stumbled across, been introduced to or have reached out to me, whose work has caught my eye. Of course, the art or the artist themselves will either have a connection to Chicago, the Bulls or perhaps even both. So without further adieu, I present to you the works of the digital artist, Alijah Villian. “There is a kingdom of knights that seek revenge in the courts of NBA. Warriors that wield swords of passion and determination, the question that we all seek is who will win the game of thrones.” Alijah told me via email when I asked him of his inspiration and the story behind this collection he has dubbed ‘Knights of The NBA’. The regal images you see above from the ‘Knights of The NBA’ collection spans over 20 different players if you wish to see more along with Elijah’s other amazing works check out his website HERE. Alijah resides on the other side of Lake Michigan in Detroit, you can contact him via his website for more information. On the eve of the release of the ESPN 30 for 30 Bad Boys documentary, it would be awesome to see what inspiration he could draw from that notorious Pistons mob and their epic clashes with the Bulls of Chicago. 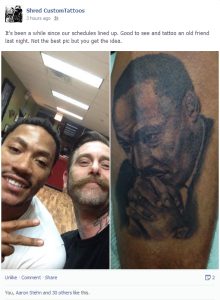 D. Rose Adds Martin Luther King Ink and Takes Selfie with Artist Shred. The Holy Trinity of Hoops Tattoos Complete. o sometime back a tattoo swirled around the internet of a guy who had a massive back tattoo portrait done of Michael Jordan and Dennis Rodman. Well those of you that don’t know, that guy was yours truly. A lot of people wondered why I hadn’t added Pip at that point, well the reason was it hadn’t been an easy task to find the perfect picture of the epitome point forward that would fit that area of my back and also the composition of the entire piece. As you’ll see below, that search finally came to an end. After a marathon 9 hour stint in the tattooist’s chair, the Bulls big three is now complete. Special thanks to Sara from Forgotten Saints Tattoo who went above and beyond to bring my vision to life. Rajon Rondo is KEY to the Chicago Bulls success. If you had to define a true point guard in the NBA, Rajon Rondo would be the definition of every trait that makes one. The Chicago Bulls last season failed to make the playoffs, causing the decision to part ways with former MVP Derrick Rose and Joakim Noah, in an attempt to rebuild their roster. When Rondo and Dwyane Wade became available as an option, however, Bulls changed their mind and pursued the veterans, to instead, retool their roster. With three ball dominant players, Wade, Rondo and Jimmy Butler shooting a combined 31% from deep last season, it seemed the Bulls added more problems to their offense rather than a solution. But the Bulls not only picked up the leading assist leader last season, but they also found their most valuable asset to finding success this season. The Bulls guard isn’t a stranger to helping his team succeed; contributing immensely to the Boston Celtics championship season in 2008. Rondo found success last season with the Sacramento Kings, averaging 11.7 assists. Rondo easily made these assists by slowing the Kings offense to almost a complete stop, then throwing it to a teammate cutting to the basket, or driving in himself and kicking out to a teammate for an easy shot. It may seem like the former Kings guard was running the floor well but the Kings were actually negative with Rondo on the floor. Kings being outscored by 5.4 points per 100 possessions. Taking a look at some preseason games with the Bulls, Rondo completely adjusted to Hoiberg’s offense. Rondo instead of holding the ball would move the ball much more letting everyone have a chance to find an opportunity to score. With a team that isn’t known for great shooting performances, Rondo allows players like Wade and Butler to run the offense, helping them score off isolation plays and finding Rondo to finish the play, similar to the offense of Chris Paul. The offense running much smoother with the 3x All-Star moving the ball around more. Bulls are adding more depth with Wade and Butler working on their three-point shooting and rookie Denzel Valentine to add to their threat. Rondo has a ton of All-Star talent to work with and is willing to evolve and improve his game to fit and improve Hoiberg’s offense. We all remember the disaster that was the Dallas Mavericks trade for the former Celtics player. Rondo was unable to fit in their offense because it would leave him open at the three-point line, which defenders invited Rondo to attempt. The Chicago Bulls focus on a lot of pick and rolls, isolation and ball movement to find opportunities for a smart drive to the basket, fitting Rondo’s play style more. Not to mention the Veteran is very vocal on the team, playing as an on-court coach at times which proved effective for the Kings. With Rose and Noah out of the picture, the Bulls have a huge hole to fill without the heart of the team and the last Bulls MVP since Michael Jordan. Rondo is KEY for the Bulls offense if they want to have a successful season with their new retooled roster and an attempt at a playoff run.